Developing new skills and learning a trade are key for young people to find decent work and be able to support themselves. Developing new skills and learning a trade are key for young people to find decent work and be able to support themselves. 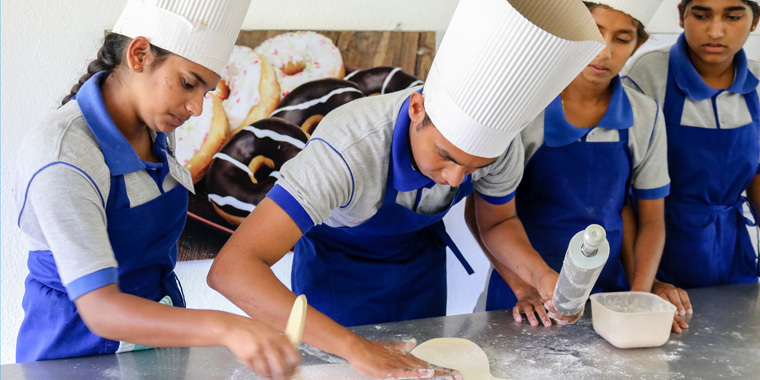 In Sri Lanka, the SOS Vocational Training Centre (VTC) in Monaragala offers training in six professions for young people from disadvantaged backgrounds, equipping them with the skills they need to find decent employment or start their own businesses. While priority is given to young people from SOS alternative care and family strengthening programs, the VTC is aimed at any young person from a disadvantaged background who wants to learn vocational skills. “We support underprivileged young people by teaching proper skills, so they can get better employment and a better salary. This also allows them to support their families,” explains Divakar Ratnadurai, National Director of SOS Children’s Villages Sri Lanka. Find out more about the VTC in this video!